Build-A-Johnny Tractor features two ways to play; free rolling tractor or buildable set. This 16-piece set includes a battery powered drill to take apart and build Johnny Tractor back together again. Made of chunky parts, easy for little hands to assemble. Includes power drill with 2 bits and 13 Johnny Tractor pieces. Ages 18 months and up. Produced by TOMY and officially licensed by John Deere. John Deere fans of all ages will enjoy this selection of farm and off-road toys! 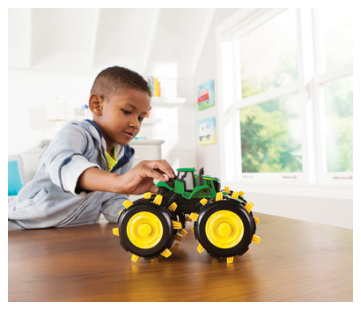 These toys combine John Deere styling with durable design and super cool features. From infant to established collector- there’s something for everyone!